We got off to a good start with a full house for our first meeting of 2016. 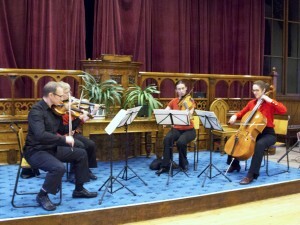 The main speaker was Professor Derek Scott, School of Music, Leeds University, whose subject was “Music and Orientalism”. This was a fascinating, informative and very entertaining presentation about the ways (sometimes bizarre ways) in which Western Music has attempted to portray or suggest “orientals”, which in effect meant anything foreign, whether from Spain, Turkey, Egypt, India, or China and Japan. His talk ranged over Mozart, Berlioz, Puccini (and many others including a recording of Rudolph Valentino) through to Chu Chin Chow, Miss Saigon, and, finally, the Pogues. His talk was illustrated not only with recordings, but by Professor Scott’s fine singing voice; and it was, I think, the first time that the grand piano has been used at one of our meetings. I know from comments which I heard that the talk was much appreciated. Here are the musical scales to which Professor Scott referred in his talk. The Town Twinning Association have some places available on their visit to Bramsche at the end of May and have asked if any U3A members would be interested in joining them on the visit. Details and contact information. On Thursday 17th December we had our last monthly meeting of 2015. It was, as all the year’s meetings have been, well attended. Refreshments, including the much appreciated “non-alcoholic punch”, were provided by Alison Greenwood and her helpers. We must thank Alison not only for the refreshments on Thursday but for providing them throughout the year. We must thank Myrna Beet and her team for organising the quiz, which was closely contested. So closely contested that four teams finished with the same score (after an objection to one answer, which was overruled). The winners were decided by the time honoured method of drawing lots. Afterwards there was a presentation by Andrew Gill (The Lanternist). 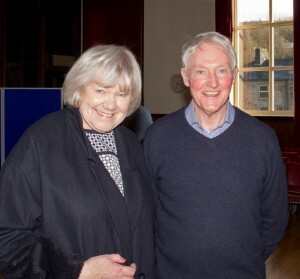 Andrew, who is a member of Burnley U3A, was making a return visit; he had been guest speaker nearly 3 years ago. He gave us another fascinating and amusing show of Victorian and Edwardian slides which was greatly enjoyed. The next meeting is on Thursday, January 21st, when Professor Derek Scott will be speaking about “Music and Orientalism”. In the meantime I trust that you have a Happy Christmas and New Year. Monthly Meeting: Did I See Marilyn? Last Thursday’s meeting was again well attended in spite of the appalling weather. Our speaker was Allan Stuttard whose subject was advertised as “From Tod to Korea and Back. National Service Remembered”. He caused me some consternation when he arrived and said that wasn’t the title of his talk – it was to be “Did I see Marilyn?”. However, despite the change of title, his talk was about his experiences as a young national serviceman who made his first trip abroad when he was sent to Korea towards the end of what he described as the “forgotten war” which claimed many British lives including two from Todmorden. As he said, his 5 week “cruise” to Korea would cost a fortune now but a modern cruise liner is probably more comfortable than his troop ship. Alan’s humorous reflections on national service and his time in Korea and Hong Kong (we learned that his presence there on the border of Hong Kong prevented a Chinese invasion – possibly) were enjoyed and appreciated. He revealed that the answer to the question “Did I see Marilyn” was yes – he saw from the back of a huge audience of American soldiers – so far back that he couldn’t be certain that he had seen Marilyn Monroe until he saw a photograph that confirmed it was her. The meeting on October 15th was well attended with 127 present (126 members and one visitor). Our speaker, Pat Osborne, presented an illuminating insight into the history of Shibden Hall and particularly the life of its most ‘notorious’ owner, Anne Lister. The presentation was enlivened by Pat’s dry sense of humour. One interesting fact which emerged was the reason that homosexuality was illegal but not lesbianism in the nineteenth century. This was apparently because nobody was prepared to explain lesbianism to Queen Victoria. I suspect that members of the audience were inspired to learn more about Anne Lister with one inquiring about the availability of translations of her coded diaries. Last month I told you about our U3A Tod Newsletter which will be issued in November. If you have any items for inclusion please contact Jean Pearson – 01706 813933 or by email to pearson382@btinternet.com. You may have noticed that we did not have the usual sale of second hand books on Thursday. It has been decided that we should stop such sales. With the increasing numbers now attending the meetings we need to have more space for seats, and in any event there has been a major fall in the number of books purchased. Also there is an increasing problem of storing the books, which are accumulating. We will be disposing of the books by giving them to some Charity shops who do sell second hand books. Last Thursday there was a record attendance of 136 (125 members and 11 visitors) for the monthly meeting . 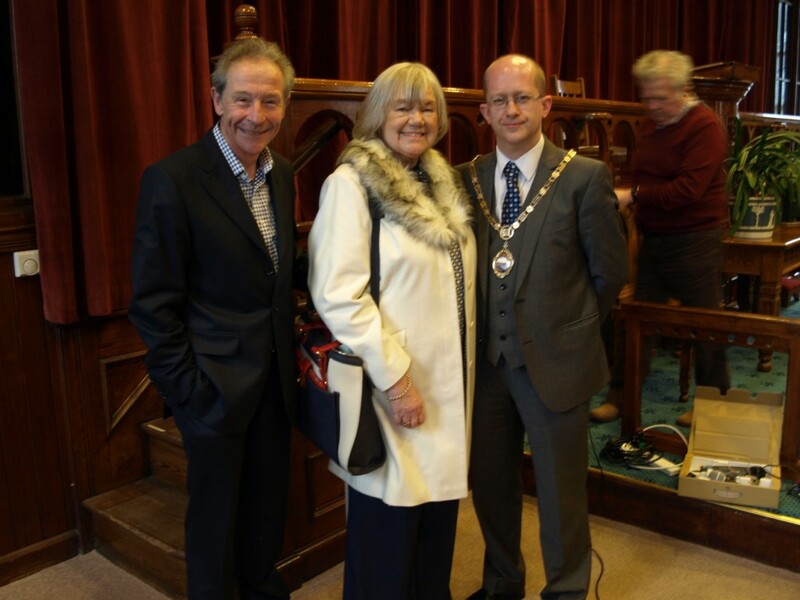 In addition we were pleased to welcome the Mayor of Todmorden, Cll. Michael Gill. Magna Carta –this will not be a long term group on the basis as other Special Interest groups but will be a study group which will last some weeks and perhaps prepare a presentation to coincide with the 800th anniversary of Magna Carta. If you are interested in any of these groups and wish to sign up please contact Gail Allaby,Groups Coordinator, gail@btinternet.com or Dee Kerslake, Asst.Groups Coordinator, deekerslake@hotmail.com . Whether or not the groups proceed depends on sufficient members expressing interest. There is a new feature on our web site – Diary – where you will find a diary of Special Interest groups and other events for some months ahead. This is still a work in progress and some meetings may be missing at the moment but it will be fully established soon. Thanks are due to Peter Gibson and Alan McDonald for their work on the Diary. Each month, at our members’ meetings, there have been comprehensive reports about current and future developments. These reports have also been circulated to our members either by email or through the post and they always appear on our website. Since January the Minutes of the monthly Committee meetings have been available on our website, too. 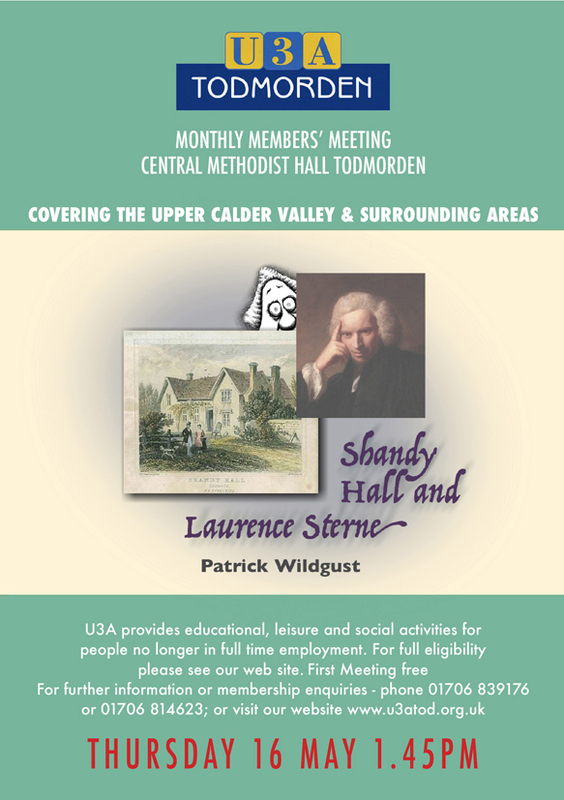 So everyone has been kept informed of everything going on in U3A Todmorden! 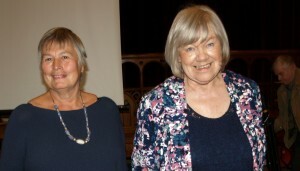 As you all know, therefore, U3A Tod continues to flourish – in April there were 370 members – in six years that has grown from the original 40 members! All our Special Interest Groups are well attended and so, too, are our members’ monthly meetings – usually attracting an attendance of over 100 members. We have enjoyed excellent talks by our guest speakers and we have more talks in place up to November with our usual special members’ meeting in December – the newProgramme of Members’ Meetings is available today. Last August we all mourned the sudden death of our esteemed Chairman – David Cross – who has been very sadly missed. As a result the Committee appointed the Vice-Chairman to act as Chairman until the AGM today. We enjoyed an extremely well-organised and highly successful U3A Tod Coffee Morning in September when over 100 people came to see our exhibition and we gained many new members as a result. Most of our Convenors attended and they were able to provide information about our Special Interest Groups. U3A Tod continues to maintain links with our neighbouring U3As in Burnley and Clitheroe and the next meeting of representatives will take place in September – here in Todmorden. U3A Tod was represented in May at the Todmorden Mayor’s Day and we have been invited to give a short talk about U3A Tod at the AGM of Age UK (Todmorden) in early July. 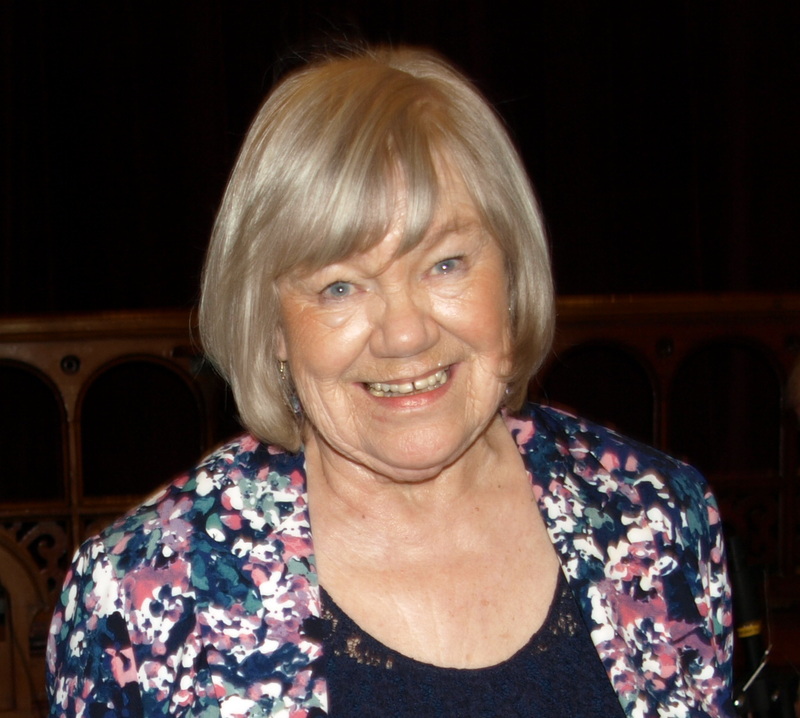 We are eagerly awaiting the visit to U3A Tod of Barbara Lewis – U3A National Chairman – who will be our guest speaker on the 18th September and we are also planning our annual Coffee Morning and Exhibition on that day as well. In December our Photography Group will again hold an exhibition at the Todmorden Tourist Information Centre. Keith Coates has now completed his term of Office of two years as Treasurer. As Secretary Anne Foster has now completed her two years in that Office. Thank you to Keith and to Anne. Our Assistant Secretary – Sarah Pennie – has served for two years and is now leaving Committee. Peter Gibson – has completed three years on Committee as our Database Controller and Technical Officer. Sue Thornton was co-opted onto Committee last June for one year to provide a link between Committee and speaker-finding. Ernie Rogan – accepted our invitation to be co-opted back onto Committee last September. Thank you to Sarah, Peter, Sue and Ernie. When our new Committee is in place today we can all look forward to the continuing success of U3A Tod. U3A Todmorden really is much greater than the sum of its parts! What a wonderful talk we’ve enjoyed this afternoon by Mai Chatham about the Chernobyl Children’s Project. Mai provided lots of interesting information about the aftermath of that terrible disaster and the National Charity supporting the sufferers. She took questions and clearly many of our members have also been involved in supporting this Charity. Peter Gibson gave the vote of thanks and members’ donations to the charity were quite considerable. Mai was extremely grateful. Our meeting had started with a slideshow about the July Let’s Go trip to the Bowes Museum and at the end of our meeting Ernie Rogan provided further information, with great enthusiasm, about this trip. Diane Collins provided samples of English and Spanish bluebells in order to correct some false information which had been provided at last month’s meeting. We also put further information about this on the notice board. Also on the notice board was a poster advertising the open art studios event in Todmorden this coming weekend. We all now know that Nick Littlewood is opening his studio and we all now know where he lives! Nick can expect many U3A Tod members to visit his home and see his exhibition, I think! 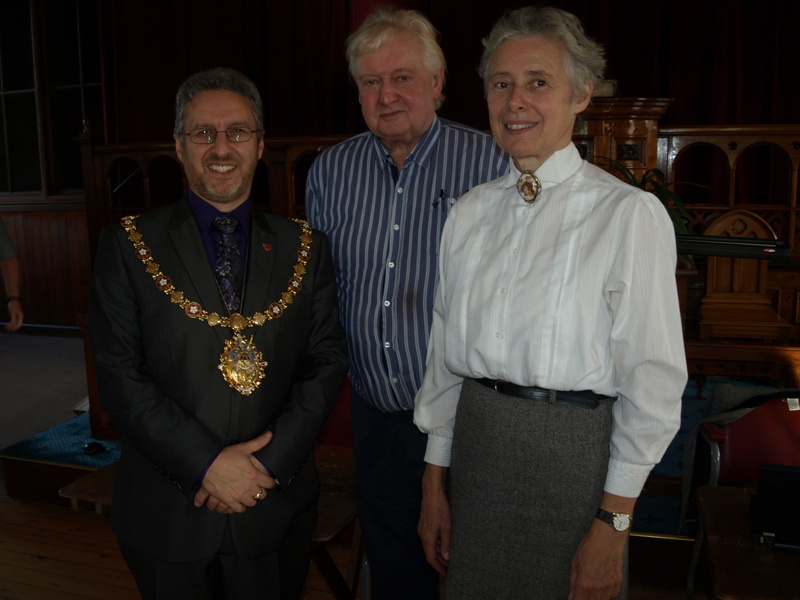 Last Saturday I attended the Mayor’s Day at Tod Town Hall on behalf of U3A Tod and the new Mayor – Councillor Michael Gill – confirmed to me that he will be joining our meeting in July. Next month it will be our AGM and, if you are on our mailing list, you will be receiving all the paperwork associated with it along with this letter. Anne Foster – our Secretary – is providing the calling papers including the agenda, information about the Committee together with a nominations form. I thanked Joan Sutcliffe and Jo Higgins for all their work this year in sending out our regular monthly news but this month there will be these extra sheets to send to you. If you are on email you will receive this information directly from Anne. Our next meeting, which will include the AGM, takes place on Thursday, 19th June, 2014 when our guest speaker will be Kathryn Ogden with her talk entitled ‘A Venetian Experience’ – (Life in La Serenissima). We will not have a bookstall on that day. Gail Allaby – our Groups Co-ordinator – gave an update on recent developments including a proposed trip to see a Vulcan bomber (organized by Ernie Rogan) and that information about online scams is available from Age UK. Gail has also put this information and contact details on our Facebook page. Now on that page we have a wonderful photograph – taken by Ann Beard – of our Walking Group in action and looks like they’re having lots of fun. Apologies that due to holidays this wasn’t posted until May 5th. 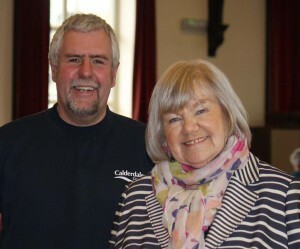 Today (Thursday 17 April) our guest speaker was David Wilson who is the Area Countryside Officer for our Upper Valley and his talk was entitled ‘The Protection of Our Rich and Natural Environment’ – the work of the Calderdale Countryside Service. He was extremely interesting and I was surprised at the wide range of activities involved in maintaining and protecting our countryside. There were many questions at the end of his talk and we all really enjoyed it. Sarah Pennie – our Assistant Secretary – gave the vote of thanks. 103 members attended and we also welcomed 7 visitors. Our guest speaker in May will be Mai Chatham with her talk entitled ‘The Chernobyl Children’s Project and the Local Connection’. With my May report for you we will also be including information about the AGM in June and this will include the AGM agenda and nomination forms compiled by our Secretary – Anne Foster. Please note that there will not be a book stall at the AGM. I know that many members renewed their membership today with Roger Howard – our Assistant Treasurer – but renewal of membership should be made at our May meeting, if not before, and we propose to open our doors at about 1.15 pm in an attempt to avoid long queues. At our July members’ meeting there will be a Fair Trade Stall. Gail Allaby provided information about our Special Interest Groups although there are no new groups planned at present. Ernie Rogan provided information about the next Let’s Go trip to the Lake District. We now have 358 members and today 118 attended our meeting together with 5 visitors. It was a great pleasure to welcome the Mayor of Hebden Royd Town Council – Mayor Councillor Karl Boggis. We opened our meeting with a slideshow compiled by our U3A Tod official photographer – the late Philip Willis – who died so suddenly and so very recently. It provided us with a wonderful range of photographs of our U3A Tod events and activities and I think it was a fitting tribute to Philip’s contribution to our organization. I reported how our AV equipment and team (led by Peter Gibson and ably supported by George Boyle) has been acclaimed as superb by visiting speakers. David Sutcliffe has now joined this team bringing with him his experience and expertise as a result of his involvement at the Hippodrome Theatre. Three members observed our recent Committee meeting and it was a pleasure to welcome them. I’ve already received some extremely valuable feedback. I again asked for more members to come along to see what goes on at our meetings – please let me know if you do. Already we have one volunteer observer for our next merry Committee meeting. The Publicity Group has been working hard on improving our website and other aspects of publicity. Nick Littlewood gave a presentation to our recent Committee meeting and I was able to show our members today the new design for our posters which go up around our region prior to our meetings. I did remind members that at the AGM in June we will need a Chairperson, a leader of our speaker-finders team and three or four more Committee members. So I am appealing again for you to come forward. Our Treasurer, Keith Coates, informed us that our fees for next year will remain the same (£15) and asked for members to use standing orders, if possible and also it helps with our finances if you can sign up for Gift Aid. Forms will be available from our Assistant Treasurer – Roger Howard – at the April meeting. Gail Allaby – our Groups Co-ordinator – gave an update on developments associated with some of our special interest groups and I am attaching her full groups’ report with this letter. It was a delight for us to welcome back Geoff Carter (Retired GP), our guest speaker, who gave us such an interesting talk entitled ‘The Galapagus, Darwin and the Theory of Evolution’. This was informative and entertaining and Geoff took questions at the end. Mayor Karl Boggis gave the vote of thanks on our behalf – he almost walked off with our token of gratitude – but I reminded him to hand it over to Geoff! Next month’s guest speaker will be Dave Wilson, Area Countryside Officer, Upper Valley with his presentation ‘The Protection of Our Rich and Natural Environment’ – the work of the Calderdale Countryside Service. Ernie Rogan gave us information about the next Let’s Go trip to the Wedgwood Museum. This made a neat link with Geoff’s talk because Charles Darwin married a Wedgwood heiress! Contact Linda Cook if you wish your name to go on the list for this popular outing. Thank you to all those who helped in returning the chairs to the edges of the Hall at the end of our meeting – we do appreciate this help. Alison Greenwood needs volunteers to help with the refreshments at the June meeting. Please contact Alison on 01706 816870 or alison.greenwood@talktalk.net if you can help us. What a pleasant and enlightening afternoon we have again enjoyed at our members’ February meeting. We tried a new signing-in system in attempt to cut down on our inevitable queues at the beginning of our meetings – I think we all found it much easier and quicker. We also put the notice board at the front of the Hall after the meeting so that members had an extra chance to peruse all the announcements, posters and so forth. We congratulated Geoff Boswell on becoming the u3a national adviser for Science. Copies of the Report by the Steering Group on the Future of the Todmorden Markets were available – you can get more information from the Tourist Information Centre. U3A Todmorden is a member of the Calderdale 50+ Network which provides a wide range of information about services available for us throughout our region. A document has now been produced and copies are available in public buildings and in GPs surgeries. If you or someone you know needs support in any way this document might provide contact details of appropriate and useful organisations. Thanks were extended to Peter Gibson and Alan McDonald for their comprehensive computer advice and guidance which has been circulated to all our email members. 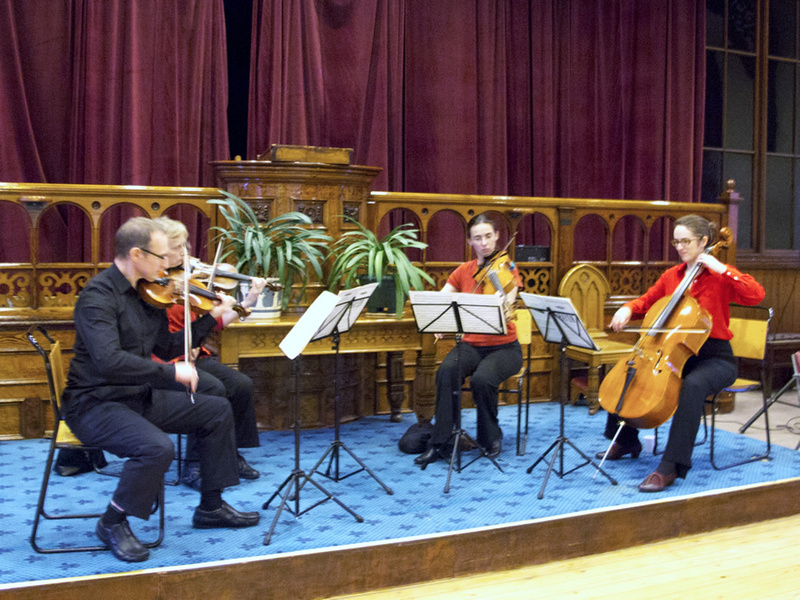 Dr Paul Whittaker, OBE, has thanked us for our donations to his charity ‘Music and the deaf’ at our January meeting which amounted to £350. We now have a little over 350 members! 98 members and four visitors attended today’s meeting. Our guest speaker in September, 2014, will be the National Chairman of U3A – Barbara Lewis. She was born in America, has lived in England for many years and currently lives in Hertfordshire but we understand that she knows very little about our region. We are sending her a copy of the book ‘A History of Todmorden’ by Malcolm and Freda Heywood (U3A Todmorden members) and Bernard Jennings. We hope she will enjoy reading it prior to her visit to these northern parts. Our guest speaker in March will be Geoff Carter – we will all be happy to welcome him back, I am sure – and his talk is entitled ‘The Galapagus, Darwin and the Theory of Evolution’. Please note that Sally Pulvertaft is not now able to give her talk about India at our April meeting – she’s re-located to France – so we are now working on a replacement speaker for you. I will keep you all informed. We were happy to show our appreciation to Alison Greenwood and her team of helpers who provide us with refreshments every month. Alison gave the Groups Report and there are two new groups – Anthony Peter’s group – Novel Appreciation – will meet at TRCR at 11 am on 10th March, 2014 and Geoff Boswell is starting an IT group as well. Sheets were available to sign up and Gail’s report will give further details. If you would like to join these groups please put your name down as quickly as possible. I will send Gail’s report to you separately – if you are on email. Gail’s full list of groups and their reports are also available on our website. Our guest speaker today was Barrie Yates – retired engineer – who presented his talk entitled ‘The Machine that Changed the World’ – the development of the motor car. We all thoroughly enjoyed his presentation which – for people like me – was not too technical. This prompted many questions from members at the end. Margaret Gunnill (Membership Secretary) gave the vote of thanks. Finally I made an appeal for members to step forward and volunteer to be nominated for the U3A Tod Committee. At the AGM in June we will need a Chairperson together with four members (one to act as Assistant Treasurer and one to be leader of the Speaker-finders team). I do hope that some of you will be prepared to give just a little time to ensure that U3A Tod continues. The guest speaker today was David Groves, a retired lecturer in psychology, and it was a joy to welcome him back. 127 people came, and heard among other news that there are two new groups – Going to the pictures and Gardening – and that a new publicity group has been formed. It was a delight to welcome 121 members and 6 visitors to our monthly meeting today. There was a special welcome to all our new members – we now have 334 members. Please let us know if you change your email or home address and also let us know if you no longer wish to receive U3A Todmorden information through the post. If you ever wish to hand deliver mail to U3A Todmorden we now have a label on our mail box which is situated at Senko House and accessed from Halifax Road, Todmorden. The new publicity group is now up and running and planning exciting developments for us. Alan McDonald is the Chairman of this new group and he wrote an excellent report on our last meeting which appeared in Todmorden News. Ernie Rogan sent a copy of that report to Chandra and Richard Law and Chandra has sent the report to her home village in Malaysia – our fame is spreading! Thank you to all our members who again stayed behind today to help put the chairs back in place – it is a real bonus to have your help. Same again next time, please! There is a change to our programme on 19th December, 2013. We will not be showing a DVD but we will be having a short talk by Trevor Driver entitled ‘Humourous experiences as a Magistrate’ The remainder of the programme that day remains as planned. Our next meeting is on Thursday, 21st November, 2013 when our guest speaker is from the Institute of Motorists the title of the talk being ‘Age Old Debate’. This does sound an interesting topic for us. We were also reminded that November is Prostate Cancer Awareness Month. Gail Allaby gave her groups report and announced two new groups – 1. Going to the pictures and 2. Gardening – and we got lots of names of interested members. She also announced that Geoff Boswell is stepping down as Convenor of the Photography Group mentioning what a great contribution he has made to the Group. Ann Beard will be taking over. Ernie Rogan outlined plans for more interesting Let’s Go trips next year. The guest speaker today was David Groves, a retired lecturer in psychology, and it was a joy to welcome him back for his ‘Part 2’, who fascinated us by what he called ‘rambling on’ about psychology. It was extremely interesting and, I think, we all wanted to hear more. Perhaps we should have a ‘Psychology Part 3’ by David. What do you think? Our Secretary, Anne Foster, gave an amusing and sincere vote of thanks.